That flavor text... Stimulate your senses. Good in aggro/rush deck with Crackle as a proper lethal method, when you finish your opponent every point of overload can be neglected. I actually use this as a 1 of in control shaman. I've only ever gotten value for it. Sure its 5 mana(in all), But killing a x/5 turn 3 saving your hex for later targets or Using it for a win condition seems fairly reliable. Sure its not as good as Kill command or Fireball but neither of those are options for shaman and who wants to crackle for 3 dmg on a x/5 and not kill anything. My point being, Its a pretty solid card in my opinion(as a 1 of). This card is so bad. Not even considerable, let alone playable. 5 Damage at 5 Mana is the least efficient spell in the game. Don't get me wrong, The 3 mana for 5 damage can be great when trying to reach, but that's the only time its useful, as it isn't worth being crippled the following turn just to deal five damage. Once it gets buffed to Overload (1), I will CONSIDER it for my deck, but even then it will still not be worth running. "When trying to reach" is the point of this card. Ideally you use it to end the game so the Overload won't matter. I wonder if this card will be completely outclassed by Crackle after GvG release. Seems so expensive in comparison just for the consistency. This seems awfully bad compared to Hunter's Kill Command. Kill Command deals the same damage, but you need a beast on the field, compared to Lava Burst's Overload (2). And with all the cheap beasts out there (not to mention the fact that a lot of Hunter decks rely on beasts), Kill Command's condition shouldn't be that hard to activate. 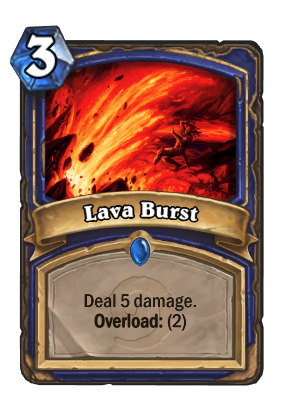 Lava Burst doesn't require a two card combo to do its full damage and it has a lower upfront cost since Hunter will pay at least 4 for Kill Command if his board is empty (and realistically it'll probably be more like 5-6 without a Web Spinner). Both cards have their advantages. Most of the time, a Beast will already be on the field regardless of the Hunter's plan to use Kill Command or not, but I do agree that there are some times when Lava Burst will be better. I just personally feel like Kill Command is useful in more situations. "oops, that was a mistake"